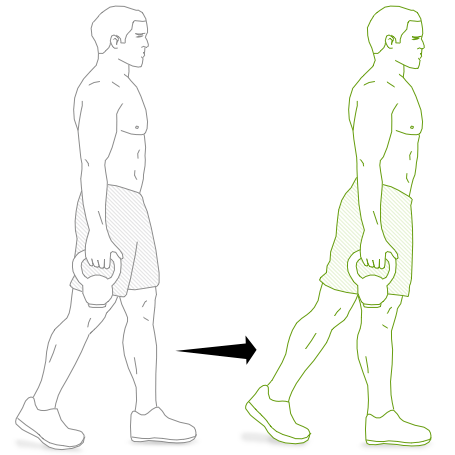 A Simple Two-Step Workout That Works Your Entire Upper Body | Valet. Sometimes you don't want to think too hard at the gym. You simply want to get in a quick, effective workout without worrying about keeping track of reps, sets and rests. Just push yourself and be done for the day. This is the workout for those days. It's also a workout that strengthens your core by targeting your chest and shoulders while working your arms and abs. In short, it's an easy exercise that will ensure your shirts fit and look better on you. All you need is a pair of kettlebells or dumbbells and as few as 10 minutes. Here's how to get started. Set a timer for anywhere between 10 to 30 minutes, depending on your fitness level and time available. 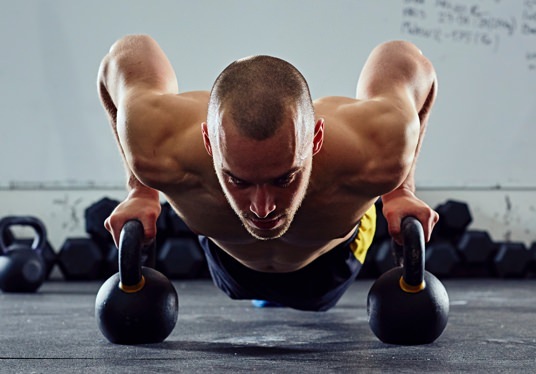 Get into push-up position with your hands holding the kettlebells or dumbbells and do as many push-ups in perfect form as you can. (For an extra burn, you can experiment with positioning your hands closer together to target the triceps and shoulders or further apart to target your chest.) When you can't do any more, hop your feet forward and stand up, picking up your weights. Carry your weights approximately 50 yards. (If you don't have 50 yards of runway, walk back and forth within the space you have.) Known as a farmer's walk, think of these carries as walking planks: Keep your lower back and pelvis aligned throughout the exercise. And tighten your grip—this will increase the tension in your core muscles. Repeat as many rounds of step one and two as possible in your chosen timeframe. Choose whichever weight you're comfortable with and from which you could get the most use. Summer is coming. Prepare accordingly with these easy but effective exercises to tone your chest and arms.